Objective: To provide healthcare providers, patients, and the general public with a responsible assessment of currently available data on the use of active surveillance and other observational management strategies for low-grade, localized prostate cancer. Participants: A non-U.S. Department of Health and Human Services, nonadvocate 14-member panel representing the fields of cancer prevention and control, urology, pathology, epidemiology, genetics, transplantation, bioethics, economics, health services research, shared decisionmaking, health communication, and community engagement. In addition, 22 experts from pertinent fields presented data to the panel and conference audience. Evidence: Presentations by experts and a systematic review of the literature prepared by the Tufts Evidence-based Practice Center, through the Agency for Healthcare Research and Quality (AHRQ). Scientific evidence was given precedence over anecdotal experience. Short- and long-term outcomes of active surveillance. Well-designed studies to address these questions and others raised in this statement represent an important health research priority. Qualitative, observational, and interventional research designs are needed. Due to the paucity of evidence about this important public health problem, all patients being considered for active surveillance should be offered participation in multicenter research studies that incorporate community settings and partners. Prostate cancer is the most common nonskin cancer in men. In 2011, more than 240,000 men are projected to be diagnosed with prostate cancer and 33,000 are projected to die from this condition. More than 2.5 million men in the United States are long-term survivors of prostate cancer. Men with a strong family history of prostate cancer and African American men are at increased risk for developing prostate cancer. Most prostate cancer is localized at diagnosis and detected as a result of screening with PSA testing. Most of these screen-detected prostate cancers are low risk and are unlikely to be the cause of death. The natural history of prostate cancer has changed dramatically in the past three decades because of PSA screening. Although most prostate cancers are slow growing and unlikely to spread, most men receive immediate treatment with surgery or radiation. These therapeutic strategies are associated with short- and long-term complications, including impotence and urinary incontinence. Only a small number of men choose observational strategies, which may delay the initiation of curative therapy or avoid it completely. Given the high prevalence of low-risk prostate cancer, there is an urgent need to clarify the role of active surveillance and other observational strategies as alternatives to immediate treatment. During the first 2 days of the conference, experts presented information on each of the key questions. After weighing the scientific evidence—including the data presented by the speakers, input from the attendees, and a formal evidence report commissioned through the Agency for Healthcare Research and Quality—an independent panel prepared and presented a draft of this State-of-the-Science Statement addressing the conference questions. Prior to the adoption of PSA screening, the majority of prostate cancer was detected because of symptoms of advanced cancer or a nodule found on digital rectal examination. These symptomatic tumors were usually high grade, advanced, and often lethal. Other tumors were found incidentally at the time of surgery for benign enlargement of the prostate. These were often low grade and localized. 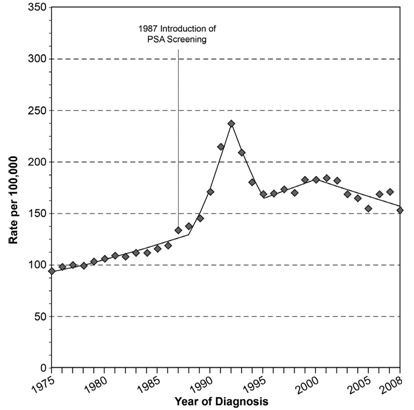 After the introduction of PSA screening in 1987, there was a spike in the rate of prostate cancer cases detected, followed by a persistent elevation above the pre-PSA testing era (see Figure 1) but no increase in prostate cancer deaths. Other 20-year follow-up studies indicate that only 5 percent of these men die from prostate cancer. All of these trends led to the need for modifications in the approach to diagnosis and treatment of prostate cancer. Today, most prostate cancer is diagnosed by multiple core needle biopsies, which are graded using a prognostic system called Gleason scoring. In this system, the patterns of arrangement of tumor cells are given a pattern designation from 1 to 5, based on their relationship to normal prostate glands. Pattern 1 is the lowest grade, and pattern 5 is the highest grade. Each tumor is assigned two patterns, one of which is the most frequently seen and the other being the highest grade in the nondominant area. The pattern numbers are then added to provide a pathologic diagnosis called the Gleason score. For example, if the most common tumor pattern is grade 3, and the next most common tumor pattern is grade 4, the Gleason score would be 3+4=7. The Gleason scores are relied upon as the most powerful indication of the patient’s expected outcome and are commonly used to define treatment strategies. Tumors called Gleason 3+3=6 are the lowest scores usually given in needle biopsy core specimens. Although Gleason scoring is the most important diagnostic tool used, the method suffers from interobserver variation and from difficulties with sampling, as biopsies constitute less than 0.5 percent of prostate tissue even when multiple cores are obtained. Incidence source: Surveillance, Epidemiology and End Results (SEER) 9 areas (San Francisco, Connecticut, Detroit, Hawaii, Iowa, New Mexico, Seattle, Utah, and Atlanta). Data obtained from National Cancer Institute. SEER Fast Stats. Available at: seer.cancer.gov/faststats/. Accessed December 6, 2011. Since the initiation of PSA screening, more low-risk prostate cancer has been detected and, by 2002, more than 63 percent of all prostate cancers detected in one large series were Gleason 3+3=6. It is likely that the percentage of cases labeled as Gleason score 6 has increased since that time. Gleason score changes parallel the increased number of prostate cancer patients diagnosed with PSA less than 10 ng/mL. Decisions about prostate cancer treatment depend on accurate pathologic diagnosis. There is a need to ensure that the level of agreement of Gleason scoring among doctors who examine prostate tissue has consistent scoring results. Additional research is needed to evaluate prostate cancer biomarkers that are different from PSA and are predictive of cancer behavior. There are two observational strategies: active surveillance and watchful waiting. These terms have evolved over time and have not been consistently applied. Active surveillance is a disease management strategy that delays curative treatment until it is warranted based on defined indicators of disease progression. In contrast, watchful waiting is a disease management strategy that forgoes curative treatment and initiates intervention only when symptoms arise. The three components of a given observational management strategy are eligibility criteria, follow-up protocols to monitor disease progression, and indicators for treatment. The evidence report identified 16 studies that meet the definition of active surveillance and another 13 that followed patients who did not receive treatment and were followed for symptom progression (watchful waiting). The most widely accepted criterion for active surveillance eligibility is the presence of low-risk clinically localized prostate cancer. Tumor characteristics commonly used to identify such low-risk cancers include tumor stage (T1c, PSA detected or T2a, small palpable nodule); PSA value (less than 10 ng/mL); Gleason score (less than or equal to 6); and extent of disease on biopsy. Patient characteristics have been used inconsistently to determine eligibility and include age and overall health status, which are reflections of life expectancy. Watchful waiting, which predated active surveillance as an observational strategy, arose out of the recognition that death from other causes exceeded death from prostate cancer in men with shorter life expectancies. Thus, watchful waiting studies used less rigid eligibility criteria, accommodating men who were older, who had more chronic illnesses, or who preferred less invasive treatment. These criteria, while similar to those used in active surveillance, allow for inclusion of men with higher PSA values and higher clinical stage in the absence of metastatic disease. The purpose of the active surveillance follow-up protocol is to detect disease progression. In previous studies, follow-up parameters included PSA, digital rectal examination, and rebiopsy. PSA and digital rectal exam were variably assessed every 3 to 12 months, but no consensus exists as to the optimal schedule. Repeat biopsy is included in all U.S. studies of active surveillance to detect disease progression and misclassification of the original biopsy. The frequency varies from one to four biopsy procedures during the initial 4-year period, with surveillance continuing indefinitely. The intent of follow-up strategies differs between active surveillance and watchful waiting. In watchful waiting, intervention is reserved for relief of symptomatic disease progression. Therefore, follow-up of prostate cancer in patients on watchful waiting is minimal. Indicators of disease progression that may lead to the recommendation for curative treatment under active surveillance include increased Gleason score on rebiopsy (e.g., a Gleason score greater than or equal to 7); shorter PSA doubling time (e.g., doubling time of less than 3 years may indicate the need for rebiopsy); or increased extent of disease (more of the biopsy tissues involved with cancer) on biopsy. 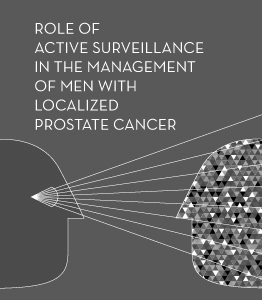 Men on active surveillance may opt to undergo curative treatment at any time; no studies formally define or measure patient factors or preferences leading to abandoning active surveillance for curative treatment. In contrast, the development of symptoms (e.g., urinary obstruction, pain, or bony fractures) is the primary indication for treatment under watchful waiting. However, some patients do opt for treatment based on individual preferences, even though these choices are not well studied. More research is needed about the two broad categories of observational follow-up, active surveillance and watchful waiting, particularly since there are variable protocols for each. As the methods are further developed and refined, new terminology may be needed to distinguish consensus-based methods from historical practices and to offer patients the appropriate strategy for their prostate cancer. Tumor characteristics derived from the prostate biopsy have been the mainstay to determine eligibility for active surveillance of men with low- and very low-risk tumors. The minimum number of biopsy cores required for representative sampling of the prostate and the value of normalizing PSA values to prostate volume need clarification. Alternatives to Gleason scoring are needed to best identify candidates for active surveillance, to avoid sampling error, and to reduce misclassification of tumors. Patient characteristics should be measured with standardized self-report instruments and integrated into eligibility decisionmaking. Such characteristics include attitudes and preferences with regard to general and disease-specific quality of life, life expectancy, and anxiety about cancer diagnosis. Follow-up under active surveillance is variable and not currently evidence based. The types of monitoring and their optimal frequency need to be defined. It is important to consider whether follow-up should vary based on tumor and patient characteristics. Alternatives to repeat biopsy should be investigated to reduce morbidity and to encourage compliance with active surveillance. However, such new technologies must balance cost and burden to the patient. Follow-up also should monitor ongoing patient concerns with risks of complications, anxiety, and worry about progression. Predicting whether a particular individual’s cancer will progress is difficult. The only clear current indicator of disease progression is an increase in Gleason score. The value of PSA doubling time is uncertain. New indicators of disease progression are needed, potentially including imaging techniques to identify clinically important tumors, molecular classification of cancers, and genetic classification of a patient’s risk for progression. Observational strategies are not consistently discussed as a treatment option for localized prostate cancer. When active surveillance is included as a treatment option, it may be presented in a negative way—for example, characterizing an observational approach as “doing nothing.” Unfavorable presentations of active surveillance may reflect physician opinion, but also may be an unintended consequence of a specialist’s perspective and training. Clinical factors also influence the offer of observational treatment. Physicians are more likely to recommend an observational strategy for men with low-risk disease (e.g., low Gleason score, PSA, stage) and limited life expectancy. Approximately 10 percent of men who are eligible for observational strategies choose this approach. Perhaps the most critical reason for acceptance is physician recommendation. Other reasons include patients’ perception that their cancer is not serious and their concern about treatment side effects. Support from family and friends as well as personal experience with cancer also are important. Patients’ decisions also are influenced by information from promotional materials, the Internet, other media, and family and friends. Approximately a quarter of patients embarking on observational treatment will undergo curative therapy within 2 to 3 years of diagnosis, and as many as half by 5 years. The reasons for leaving active surveillance are often unclear. Different active surveillance protocols specify various indicators for moving to curative treatment, including reclassification based on repeat biopsy. In addition, patients often choose to move to active treatment for reasons other than disease progression. Because patients need to reaffirm their commitment to active surveillance on a recurring basis, ongoing physician and family support are important. The same factors that contributed to the acceptance of active surveillance also likely influence adherence. Future studies of active surveillance would benefit from a robust conceptual framework that better explains the many influences on decisionmaking. Research should explore physician, patient, health system, communications, and other societal factors that influence decisionmaking, and the ways in which these factors interact. The impact of race, ethnicity, social class, and access to care in shaping views and decisions about active surveillance. Ideally, future research also should include comparisons of different strategies for offering and supporting continued participation in active surveillance. There are no completed randomized clinical trials to determine whether patients who undergo active surveillance have better or worse outcomes than those who receive immediate curative treatment. However, there are noncomparative cohort studies that are examining active surveillance in men with low-risk disease. Early results demonstrate disease-free and survival rates that compare favorably to curative therapy. There is no standardized reporting of complications associated with the active surveillance strategy in any of the studies reviewed. The Scandinavian Prostate Cancer Group 4 Trial reported significantly higher prostate cancer-specific and overall mortality rates in patients who were randomized to watchful waiting compared with radical prostatectomy. These patients were enrolled in the pre-PSA era and had more clinically advanced disease than is seen today. These results may not apply to current populations who are identified with low-risk disease by PSA screening. There is weak evidence from comparative cohort studies that watchful waiting results in an increase in death rates relative to both radiation therapy and radical prostatectomy. The Prostate Cancer Intervention Versus Observation Trial, a randomized controlled trial that included a large proportion of patients identified by PSA screening, compared watchful waiting with radical prostatectomy. With a median follow-up of 10 years, there were no statistically significant differences in prostate cancer mortality or all-cause mortality. However, this trial has yet to be published. Another large randomized trial is under way in the United Kingdom, but results will not be available for 5–10 years. Supporting data from additional cohort studies give us confidence that the risk of death from prostate cancer is minimal in a low-risk population followed for 10–20 years. There are side effects associated with any treatment strategy for prostate cancer. Radical prostatectomy causes sexual dysfunction and urinary incontinence in a substantial proportion of patients. In addition, there is 30-day mortality of one-half percent. Radiation therapy often causes bowel, sexual, and urinary dysfunction. Active surveillance complications include biopsy-related infections, pain, and anxiety. Rates of these or other complications have not been reported systematically. These patients also experience the treatment side effects of curative therapy when they undergo therapy. However, only those patients who require curative therapy will experience the side effects, enabling a substantial number of patients receiving active surveillance to avoid or delay these side effects. There is limited evidence to determine the short-term impact of active surveillance, compared with immediate treatment strategies, on general health-related quality of life measures such as physical functioning, mental health, social interactions, and role performance. There is some evidence that, for all strategies, general physical and mental health recover similarly in the long term. In contrast, for disease-specific quality of life, both radical prostatectomy and radiation therapy patients experience worse urinary and sexual functioning compared with observation patients. These differences persist over time. In spite of insufficient evidence to determine the outcomes associated with active surveillance compared with other immediate treatment options for prostate cancer, we do not believe that randomized clinical trials are necessary to define this for all populations. As there are no clinically important differences in mortality between observational strategies and immediate curative treatment for men with low-risk prostate cancer, future efforts should focus on the impact of various active surveillance strategies on treatment morbidity and health-related quality of life. We have a particular concern with the complications that result from image-guided transrectal biopsies of the prostate. Standardized protocols need to be developed to minimize the frequency and intervals of biopsies and to reduce associated pain and infection rates. Furthermore, in all future studies, patients’ self- reported health-related quality of life indicators both for generic and disease-specific measures are warranted. Costs of different treatment strategies should be measured prospectively, including the costs that accrue to patients. Additional data are still needed to determine how all outcomes—including mortality, morbidity, health-related quality of life, and costs—differ between observational and curative treatment strategies for men with intermediate- to high-risk prostate cancer. Given the variation in how observational strategies have been implemented, we also need to know how active surveillance impacts outcomes relative to other observational strategies. Develop or improve pathologic, molecular, genetic, and imaging predictive markers, and evaluate their validity and reliability. Examine the differential impact of socioeconomic status, race/ethnicity, and other social determinants on the offer of, acceptance of, and adherence to active surveillance and their effect on morbidity and mortality, and address any disparities emerging from these differences. Determine optimal protocols for active surveillance that balance the need to detect disease progression with the need to minimize the frequency and intensity of monitoring. Compare the effectiveness of different active surveillance protocols in studies of short- and long-term outcomes on patients and their families. Ideally, trials should be done in cooperative or multicenter group settings, should include a variety of populations eligible for active surveillance, and should be large enough to conduct thorough predetermined subgroup analyses. Develop methods to enhance the decisionmaking process related to acceptance of and adherence to active surveillance. These studies should include patients, family, physicians, health systems, communications, and other societal factors that influence patient choices and the ways in which they interact. Investigate the comparative effectiveness of active surveillance versus curative therapy for low-risk patients with long life expectancy and for intermediate- and high-risk patients with limited life expectancy. Create registry-based cohort studies that collect longitudinal data on active surveillance participants, including clinical and patient-reported outcomes. Establish incentives to encourage participation. Study lifestyle and therapeutic interventions for patients undergoing active surveillance. Phaedra S. Corso, Ph.D., M.P.A. Charles F. Lynch, M.D., Ph.D., M.S. Janet A. Tooze, Ph.D., M.P.H. Planning Committee members provided their input at a meeting held August 11–13, 2010. The information provided here was accurate at the time of that meeting. NIH Consensus Statements, State-of-the-Science Statements, and related materials are available by visiting http://consensus.nih.gov; by calling toll free 888–644–2667; or by e-mailing consensus@mail.nih.gov. Or, written requests can be mailed to the NIH Consensus Development Program Information Center, P.O. Box 2577, Kensington, MD 20891. When ordering copies of this statement, please reference item number 2011-00035-STMT. The Evidence Report prepared for this conference through the Agency for Healthcare Research and Quality is available on the web via http://www.effectivehealthcare.ahrq.gov/ehc/ products/310/859/EvidReport204_ProstateCancer_20120111.pdf. Printed copies may be ordered from the AHRQ Publications Clearinghouse by calling 800–358–9295. Requesters should ask for AHRQ Publication No. 12-E003-EF. The NIH State-of-the-Science Conference: Role of Active Surveillance in the Management of Men With Localized Prostate Cancer was webcast live December 5–7, 2011. The webcast is archived and available for viewing free of charge at http://consensus.nih.gov/2011/prostate.htm.